I’ll have to admit that there’s a lot to contemplate and definitely more strategies than one can fathom when it comes to why Time Warner is really chasing down this business strategy. 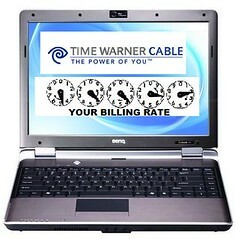 But the below are more opinions and observations of how Time Warner metering service could effect your broadband as of current and how more information is better than buying into just straight sales pitches. If in the end, you still want tiered billing, it’s your right as a consumer to choose. Is it truly infrastructure costs that are driving metered billing? I sincerely doubt it but benefit of the doubt should be applied. I mean, heck, in 2006, TWC SVP spoke of the fiber acquisitions into markets they didn’t have and at five hundred million here and there, that adds up. In the same year, they were touting that their fiber backbone was a 10Gbps IP network. Note that this is purely for data and not anything else. While I have spoken to TWC personnel in the past and they should be if conversations did not elude me, be past those limitations these days, especially when they are taking on FiOS markets with DOCSIS 3.0 deployments. What exactly is this? DOCSIS is the standard at which your data is transferred over a cable modem. Currently, you pay for something like a 6Mbp downstream and probably 768kps upstream. The potential of a DOCSIS 2.0 at maximum is 42.88Mbps downstream and 30.72Mbps upstream. Notice the difference? Now, no one really “needs” the maximum potential of DOCSIS 2.0 unless you’re running a business with extraordinary data traffic. Even DOCSIS 3.0 is out in left field for your average consumer since it basically binds 4 or 8 channels together to give you maximums (171Mbps/343Mbps) downstream and 122Mbps upstream. Yes, geeks can start drooling now for no reason. But if you’re thinking that no one else uses this “supposed” high end technology, think again. The infrastructure stays the same, but the modems have to be changed out. That costs around a hundred USD per household. And if you do some price comparisons internationally, you’ll find that Liberty Global and NTT Communications basically sell DOCSIS 3.0 service at almost similar pricing monthly as what current US consumers pay. Except, we’re getting the data caps too. Does Anyone Really Bite on Infrastructure Costs? I doubt it. I’m really not sure why they hold to that story. From a public relations perspective, it doesn’t hold much water and just makes it look bad. Let me put it in another perspective. So far, there have been price comparisons between Roadrunner Lite with the 5Gb plan and basically what you gain is…. (drumroll) more limitations! Introducing a 100Gb plan doesn’t change anything except further the anger of the customers. And no, the fee cap at seventy five dollars doesn’t begin to make it an “unlimited” plan. Basically, the bottom line for potential unlimited is going from fifty dollars a month to one hundred and fifty. That’s a 3 times inflation in a recession. I mean seriously. You’re going to tell me that my upper limit is now 100Gb for seventy five dollars a month that is more than I pay as of current? Please. Don’t insult my intelligence. Now if they wanted to set an upper data cap like Comcast and be done with it there, then I would almost say that it’s quasi-acceptable since 250Gb is more difficult to reach unless you do some seriously naughty things (or transfer some major linux cd/dvd images). It is actually possible to scrape up 4TB of data in a single month, but if that’s the case those people can also be flagged and throttled. There are plenty of ways to stop abusive consumers without trying to throw out a weak PR push on how it’s about the infrastructure. You thought that you’d get insulted by the 100Gb side? Wait one minute. There’s actually MORE. For the so-called light e-mailers, there’s the fifteen dollar a month plan with the data cap at 1Gb. With spam at all time highs and botnets taking over systems left and right, I’m surprised anyone would even think that 1Gb is a “lower” limit. Don’t forget that people will still surf here. On top of this, they introduce DOCSIS 3.0 pricing at a mere $99 a month with no said cap? Why would you keep insulting your customers. It’s basically a neener-neener, we’re rolling this out in competition with FiOS markets but because you don’t have competition in your market, we want to charge you more because “WE CAN”. Businesses Will Not Be Effected? Think Again. Right now, the word from their spokespersons is that businesses will not be effected by this data cap. But do not forget that if this “test” actually does work, that businesses will rightly get charged. Why? Let’s take a quick look at current differences between data plans. Business class service is still bandwidth capped and in fact more strictly than residential. The difference is that the amount of money you pay per month is uptime costs. That means that if this tiered billing system does go somewhere, then businesses will eventually become “equal” with residential with the only difference being different data caps and uptime guarantees. We haven’t seen it yet, but Time Warner and other internet service providers are playing with fire in this scenario. Much like the Net Neutrality arguments where ISPs lined up on one end and major tech corporations (Google, Microsoft, Amazon, etc) lined up on the other side, we have yet to see push back from these giants. But believe me, they will stand on the side of the consumers. Very simplistic reasoning. If you take away consumers from the content, then it hurts the margins of these giants. And whether you like it or not, these corporations along with content providers such as Hulu, Netflix, and the like combined are a force to be reckoned with when it comes to their legal war chests. Don’t forget that this maneuver would also get those not involved in Net Neutrality such as Sony, Blizzard, and other gaming industry people involved due to the fact that data caps actually do hurt online gaming. Bottom line? Maybe I’m crazy but stacking the deck against yourself doesn’t help you survive for long. And when you hurt the bottom line of multiple industries and international conglomerates? Unless there’s some sort of huge legal cash reserve that we don’t know about, it’s probably not a good idea to bite off more than you can chew. Incurring the wrath of MS and the big G isn’t a great way to make friends either. Outside of the legislation to stop this inane billing behavior, let’s take a look at what else this would deter. The Obama administration has included stimulus money to provide broadband into every household. Now, maybe I’m incorrect in this, but tiered billing should make any internet service operator ineligible for this government funding. Why? Based on current pricing of Roadrunner Lite with the data caps, the justification is obvious. As an infrastructure operator, it’s actually making it more difficult to get service since you’re putting more limitations on service. If I were any Congressperson, I would be investigating if we should even be providing these corporations monies to “build out” when they’re trying to push more cost onto their own customer base in bad economic times. It’s Not about Internet Content? Strange. If the technology isn’t going towards IP generated traffic and Time Warner Cable isn’t trying to protect its own primary business then you would think that they wouldn’t be trying to deploy television on these ip networks. But they are. It’s called over-the-top television. Basically, it’s the television shows delivered over the Internet. Now you would think that this is actually cutting off the nose to spite the face, but with some strange logic it actually does make sense. They [TWC] want to decrease their cost of delivery and increase the last-mile end without doing anything. And hoping to pull the wool over the consumers’ eyes in the process. Just think about it in this fashion. This tiered billing news follows the one where some of the online shows will be going to full-subscription based. So guess what? The consumer gets to pay out potentially three ends. Once for the show, and once for the monthly data cap, and once for overages. All for the same content. So if you’re a television junkie? Here’s a royal screw you from TWC. What I find absolutely discouraging is that Time Warner is leading this charge and other service providers are meekly doing this in the background thinking that the consumer will stand by and do nothing. Now if TWC had implemented the 250Gb shift, then I think there would be some grumbling but most people would have set it aside even with the comparisons. But data caps set up to make you go over or pay more overall when the majority of infrastructure costs are fixed costs not only adds insult to injury, but it basically gives no reasoning for consumers to have any sort of customer loyalty to their business. In essence? You never tell your customers to pay more for the same service unless there is justification (upgrades, more features, etc). In the end, this drives two different problems for Time Warner. The first are the first adopters. Those that are driven by Internet business will probably get direct fiber lines to their business which will drive the cost of fiber even lower. They would have to look at T1s or shared/partial T3s as an increased cost but without limitations of which cable providers want to limit themselves in their own businesses. The second would be the younger generation gap. In providing data caps, you not only stifle the adoption of Internet services but younger generations will find other things to do instead of watching either shows online or television. Which in turn will hurt their profit margins instead of help. If you don’t believe that this is how things work, just take a look how text messaging became the next generation of communication for young people in Europe in the last decade. Why? Because the cost of phone service from country to country was too expensive but text messaging was dirt cheap. So eventually, everyone shifted towards texting. In the same fashion, if you alienate your younger generations from their current loves, then they’ll shift their habits to other means. And that’s just not very profitable. I tend to think as well that the biggest push back will be other corporations. This plan is anti-competitive and steals profit from others, and thus will fall apart under their pressure. The gradual approach of TWC is obviously the ‘death by a thousand paper cuts’, and we need to fight it now.